Mardal, the traditional percussion of Odisha, has a distinctive character of its own in its size, shape and mode of playing. its distinctive sound patterns and subtlety in resonance have established its own identity .Mardal is used as an inevitable musical instrument in the ritualistic service by mardal players (Madeli seva)in the temple of Lord Jagannath. For Odissi classical dance and music Mardal is an inspirable percussion . it has now endeared common people sans art connoisseurs and craved its own niche in the realm of Indian classical instrumental music. 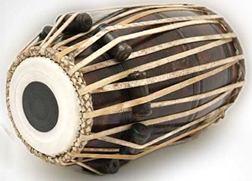 The history of Odisha's musical tradition goes back to the 2nd century B.C. as we have documentary records of histrionic arts (Gandharva Kala) explicitly reflected on the rock edicts of elephants caves (Hatigumpha) of king Maha megha vahana Kharavelain udaya giri hill at bhubaneswer.